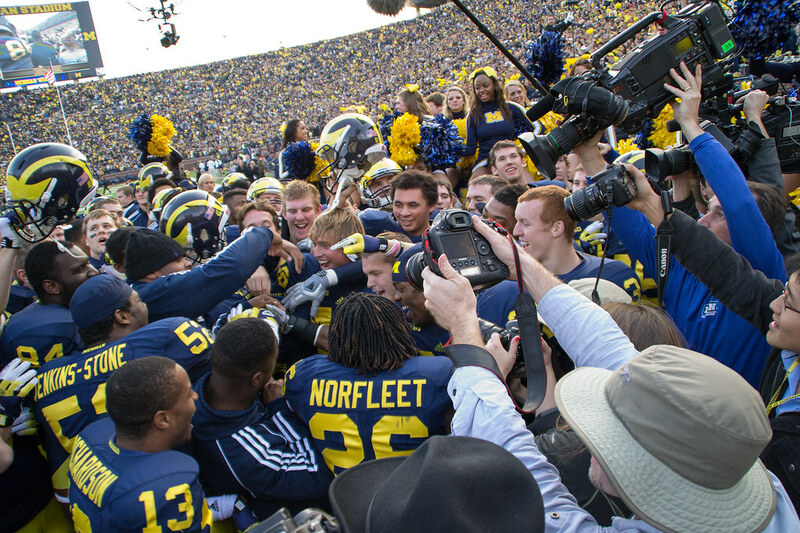 Somewhere at the bottom of that heap is Devin Gardner. My 5 takes from last Saturday at the Big House. Devin continues his success at QB. As was the case last week in Minnesota, Michigan's offense found another gear that had been lacking with Denard at quarterback for most of the season. Michigan's offense in this game felt controlled, in command and poised. Devin just has a sense of leadership on this offense that I think has taken a lot of people by surprise. I think his time at WR gave him the much needed opportunity to get on the field and gain that confidence that only comes with playing time. Much more on the Devin/Denard situation to come. The running game. It showed signs of life this week. I think the more pro-style offense that Garnder runs suits Michigan better on offense. We're still trained to run the spread-option, but I don't think it's working for Fitz. He's a downhill runner. I really like that Rawls can come in and compliment Fitz...although, it might be the other way around, actually. I thought the line blocked better this week. Hoke stayed with the same lineup he's had all year across the line, so it was encouraging to see the interior especially, play better. Michigan's D stiffens at the end. It was not a banner day for the Michigan defense. Much like the Air Force game earlier in the year, the high-powered spread-option gave us fits. You'd think with Denard Robinson on the team, Michigan could gameplan better in practice, but quick, shifty quarterbacks are like kryptonite for this defense. All due respect to Cain Koutler, he's a tremendous athlete with amazing ability. Both he and Venric Mark are better than they get credit for. In overtime, on 4th and 2, Michigan showed Northwestern a defensive look that they hadn't seen all day, and it worked brilliantly. I don't know why it took until the last play for Mattison to bust out that package, but I'd love to see more of that in Columbus in two weeks. Treezy. Roy Roundtree made a bunch of great receptions in this game, not just the spectacular one at the end. He's definitely the favorite target for Gardner. It's great to see the 5th-year senior get more involved in the offense, even though it's late in the season, I'll take it. The student section. Yes, this is my obligatory student section rant. We all have one. This is mine. It's embarrassing. That's all I can say. I keep hearing everyone's excuses...the fact that students like to sleep and noon games are tough...but even still, the student section never filled in all afternoon. Even 3:30 kickoffs are a struggle for students, so the sleep/hangover argument is moot. I think they're just lazy and not motivated to get there on time. I don't know how you solve that, but awkward videos of football players begging students to roll out of bed on time doesn't seen to be doing the trick. Make the student section smaller and/or make seating first-come-first-serve. It may not solve the problem, but it can't hurt. Bonus take: What's up with Pat Fitzgerald's reaction to the out-of-bound hit penalty late in the game? Keep it together man. It was a bogus call anyway.